What Is FFPE Tissue And What Are Its Uses - BioChain Institute Inc.
Formalin-Fixed Paraffin-Embedded (FFPE) tissue specimens have been a staple of research and therapeutic applications for decades. FFPE is a form of preservation and preparation for biopsy specimens that aids in examination, experimental research, and diagnostic/drug development. A tissue sample is first preserved by fixing it in formaldehyde, also known as formalin, to preserve the proteins and vital structures within the tissue. Next, it is embedded in a paraffin wax block; this makes it easier to cut slices of required sizes to mount on a microscopic slide for examination. The process first starts by obtaining a tissue specimen. Tissues are collected in a variety of formats, such as from both diseased and normal individual donors. Another method is matching a pair of samples from the same person. This is picking a diseased and healthy tissue from one person. Oncologists often compare an initial (or primary) tumor with samples from more distant metastatic tumors in a single patient. In some instances, four samples are obtained: healthy and diseased tissue for FFPE purposes and for freezing purposes. A block of human tissue is excised for a patient or donor. Tissue can also be obtained from other animals, such as mice or even snakes. Ideally, the block measures only a few small centimeters, but this depends on the source of tissue and the nature of the extraction. Immediately after excision, the tissue is immersed in a solution of 10% neutral-buffered formalin for about 18-24 hours. This hardens the tissue to help it survive the following steps. To prepare for infiltration by wax, the tissue is dehydrated and cleared, often using increasing concentrates of ethanol. Then, it is embedded into IHC-grade paraffin, which is sold specifically for embedding formalin fixed tissues. The time of fixation is vital in FFPE – tissues fixed too soon after excision may be useless for molecular biology studies, but tissues must be fixed long enough to preserve them. Figure 1 shows an example of prepared tissue samples. Once the samples are acquired, they are handled with care to ensure that high quality is maintained. Failure to do so can result in a sample that exhibits unusual characteristics that may result in misleading deductions. The method of preparation generally varies depending on the requirements outlined by the physician or researcher requesting the FFPE tissues, ranging from specifications about size, the purpose of tissue, or even how tissue is cut. For example, muscle can be cut along the “grain” of muscle fibers, or across them. A certified medical pathologist will be involved in the preparation of the sample, both to ensure the procedure is completed accurately, as well as to assess quality once the sample is complete. Completed tissue samples are stored in tissue banks, such as in hospitals or research centers. It is good standard practice to keep useful records on when tissue was collected and preserved, along with demographic information about the tissue (such as age, ethnicity, gender of the donor, and origin, duration, stage of diseased tissue, etc). It is also critical to store information on signed consent forms and other legal documents pertaining to the tissue, which can have a definitive impact on whether FFPE tissue is usable in research or clinical trials. FFPE tissue slides prepared properly are very durable and can be stored at room temperature for years, or even decades. FFPE tissues are frequently used in a technique called immunohistochemistry (IHC), in which tissue sections are mounted on a slide, and then bathed in a solution containing antibodies that will bind to specific proteins or structures. Stains can then be used to visualize the antibodies, which will show what proteins or structures are present in the sample, along with their location. This information can be critically important to a doctor looking for signs of diseases, such as cancer or Alzheimer’s disease. Information gained from IHC is also vital to most cancer research projects being done in labs today. The therapeutic areas where the formalin-fixed and paraffin embedded specimens are most commonly used are:Oncology: FFPE tissues are key to the study of oncology, or the study of cancer, as preserved tumor tissues exhibit very characteristic morphologies. Researchers often use FFPE tissue to look for specific proteins. The presence of these proteins can be used both for diagnosis and assessment on whether a therapeutic antibody is likely to be useful for treatment. FFPE tumor tissues should have a minimum tumor content of 60% unless indicated otherwise. Hematology: the use of FFPE tissues is vital for studying blood and related disorders. Hematology has paved the way for the discovery of many cures to diseases caused by anomalies in the blood and its components. Studies related to the bone marrow are applicable in toxicology, tissue regeneration, and genetics. Immunology: this study analyzes the responses of the immune system in the healthy and diseased state. Studying tissue samples from a person with an autoimmune disease makes it possible to determine the cause and develop medication for the defect. Comparative: samples from healthy donors, who have willed their bodies to science, are used for comparative purposes for all of the studies above. Often, as an alternative to diseased tissue, healthy tissue is necessary for research and development. One possible complication to the formaldehyde fixation process is that it denatures the proteins present in the tissue, and this can make them invisible to antibodies developed to detect them. Antigen retrieval techniques have been developed to compensate for this. Recent techniques have been developed specifically to recover DNA, RNA, and proteins from FFPE tissue samples. This opens up a vast trove of preserved, annotated material that can be used for molecular biology and biochemistry studies, such as shown in figure 2. Future work will be done using FFPE tissues as a source of DNA, RNA, and proteins from archived and documented materials. The quality of the FFPE tissue is critical for this work. Even the most well preserved tissue will still have partially degraded DNA and RNA, and generally inactive proteins. Therefore, there will be a smaller selection of archived and healthy materials available. Storage: FFPE tissue can be stored with more cost-effective and simple methods. Long-term storage for frozen tissue can be difficult since freezers are expensive, require energy, and require frequent maintenance to keep from breaking down. Durability: frozen tissues deteriorate quickly in room temperature. They are also more fragile to handle then FFPE tissue samples, due to lack of preservation material. Although FFPE tissues may be advantageous to use in some situations, it is important to note that frozen tissues have important applications as well, such as in molecular analysis or native morphology studies. An example of research using frozen tissue is displayed in Figure 3. For more information on this topic please see our blog post titled FFPE Tissue vs Frozen Tissue. BioChain offers a wide variety of FFPE tissue from difficult to obtain tissue sources in varying formats, such as individual slides, panels, and arrays containing up to hundreds of sections. Clinical history and demographic information is available for all tissues. Samples are sectioned at 5 micrometers and mounted on positively charged glass slides. FFPE tissues are prepared using the highest standards in the field, including identification by our board-licensed pathologist using the sample repository network, established by IRB-approved ethical standards and procedures. Tissues undergo rigorous quality control measures to provide reliable and consistent samples in every preparation, including staining slides with H&E to ensure an excellent product. 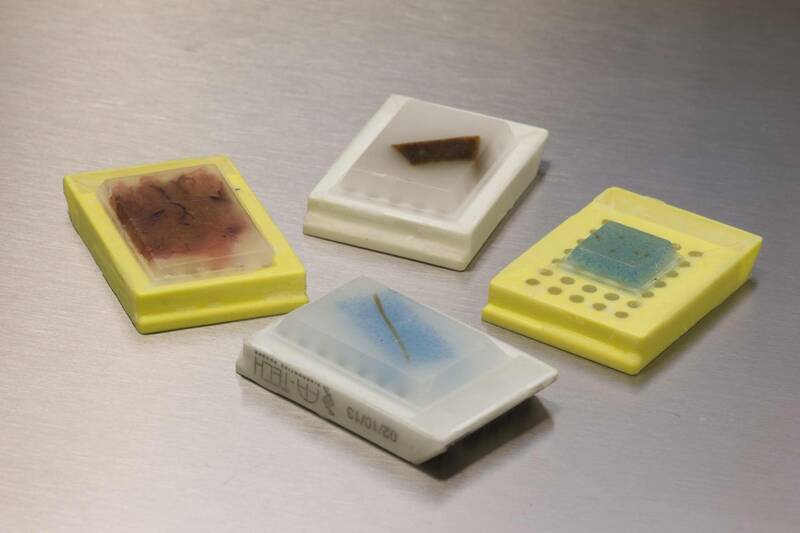 BioChain also creates custom arrays tailored to the specific needs of customers, including procuring rare tissues and fixing them to slides. Custom services also include isolation of DNA, RNA, or protein from tissues used to create custom arrays, as shown in figure 4. BioChain’s CancerSeq™ FFPE tissues are tumor tissues that have been prescreened extensively for single nucleotide polymorphisms (SNPs), insertions & deletions (indels), and copy number variations (CNVs). Targeted Next Generation Sequencing (NGS), using cancer gene panels, was performed to identify mutations and mutational hotspots. These tissues are ideal for verification, genotyping, or identification of new mutational hotspots. Find out more information or browse samples of FFPE sections, panels, arrays, and NGS Characterized CancerSeq™.